One Time Deal - Rose De France Amethyst (Ovl 11x9 mm) Pendant in Rose Gold Overlay Sterling Silver 3.100 Ct.
Amethyst (Cush 8x6 mm), Blue Diamond Pendant in Sterling Silver 1.500 Ct.
Mega Deal-Amethyst Geode Pendant in Sterling Silver 105.000 Ct.
Rose De France (Pear) Pendant in Sterling Silver 1.750 Ct.
9K Yellow Gold AA Amethyst Stellaris Cut Pendant 3.750 Ct.
Rose De France Amethyst (Ovl) Cluster Pendant in Rose Gold Overlay Sterling Silver 2.250 Ct. Wear the thrilling hues of amethyst at the base of your neck, with a heightened factor of posh glamour. The stunners in our selection let you have a peek at all that is sublimely gorgeous. Come and take a look at the lushness we have to offer with our scoping variety. From dainty and delicate designs to chunkier and bold features, we have everything for your individual tastes. Select your pick from the bestselling amethyst pendant designs. The single-stone charm of the majestic stone is single-handedly capable of stealing the show. Graced with perfected faceting, the gems in our array of amethyst solitaire pendants have a mesmerizing glamour quotient. With the stupefying lilac hues, the pendants have a rich and noticeable presence that will garner you all the positive attention. We all know to put a halo around the things that we see as sacred and enlightening. It’s the exact same with our pendants. The glorious, profound, and differently hued amethyst variety has been accented by other gemstones that capture its thrill. The amethyst halo pendants in our divine selection know and flaunt magnificence in its purest form. The designer amethyst pendants in our selection offer you all the artistic brilliance there is. With a besotted sense of uniqueness, these amethyst pendants portray the stunner colour show paired with crystal delight. Hailing from the famed names, such as Giuseppe Perez, the stunner in our array will make you lose your words in appreciation. 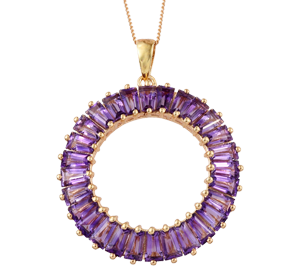 We understand the pain of shopping for amethyst pendants online in UK. There is no way of knowing if the deal you’re getting is authentic or not. But, worry not, beloved customers. At TJC, we promise you the best available quality and unmatched prices of the beauties in UK. Our selection has some bling-tastic additions that promise you exclusivity in design and richness in make. Because we source our gemstones directly from the mines, we also deliver the promise of purity. Another benefit is that we can offer you the most affordable amethyst pendants, which have prices that you won’t see anywhere else. However, this isn’t all that we have to offer. We have an unending and sublime selection of rings, earrings, necklaces, and a lot more. And not just with the use of amethyst, but you’ll find a rich and diverse collection of several other gemstones, all in the best of their quality. So, come on and shop for lots, only and exclusively at TJC!